A 22:00 - Not suitable for pets no smoking ban accompanied by a party or event check-in time is 15:00. - Information is not operating from 10:00 am to 10:00 pm. Other requests are please requested within the time limit. 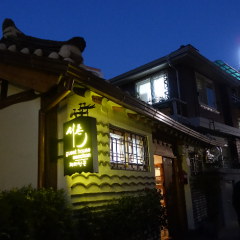 - Unroll the required non-Bed Experience the traditional way of Korea ondol type of Shigeru night. - Building your life, you take off your shoes. - Use as a living room, kitchen, bathroom all public areas. - Toilet yen shampoo, conditioner, body shampoo, hand cream> The Bathtub. - The capital city that has been locked out, lights are turned off, please check again.